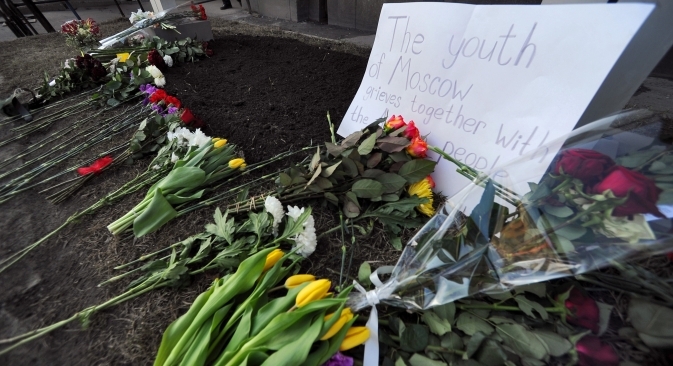 Russians in the United States believe the reaction of ordinary Americans to reports of a “Russian connection” in the Boston attack has shown how little people in the U.S. know about Russia and how weak Russia’s “soft power” is in the country. However, they do not expect Americans’ attitudes toward Russian speakers in the U.S. to decline. The reaction of ordinary Americans to reports that the suspects in the terrorist attack on Boston are from the Northern Caucasus has shown how weak Russia’s “soft power” really is in the U.S., according to the president of the Coordinating Council of Russian Compatriots in the U.S., Igor Baboshkin. “People here [in the U.S.] don’t understand what is going on in Russia. There is a lack of information that leads to people believing there are terrorist training centers somewhere in Russia,” Baboshkin toldRBTH in a telephone interview. He added that he felt a certain tension coming from local Americans following the Boston attack, which killed three people and injured around 200. This prompted him to explain that Russia was fighting terrorism in the Northern Caucasus itself. “We [Russian compatriots abroad] are trying to explain to the Americans that we have also had a lot of problems coming from that region. We had the Moscow metro bombings, the hostage situation at the ‘Nord-Ost’ musical performance, and the Moscow–St. Petersburg train explosion,” Baboshkin said. The fact that this was news to many Americans, and that they did not know terrorism was a common pain for both Russia and the United States, only goes to show how little they know about events in Russia – and, consequently, how weakly Moscow uses the “soft power” tools. “The Russians kind of dropped the ball on this one,” said Baboshkin. He noted that, in the U.S., Russia currently has only one cultural center in Washington, D.C., with a meeting hall that can accommodate 30 people. “How can a single hall with a 30-person capacity help promote ‘soft power’ in a country of 300 million?” said Baboshkin. “We have been lobbying the [Russian] government on behalf of the Coordinating Council of Russian Compatriots in the U.S. for another cultural center in New York City, but this matter just can’t get resolved. Either they have no money, or they have more important things to do. We cannot even organize an exhibition here,” he complained to RBTH. At the same time, in the wake of the attack in Boston, Baboshkin does not expect the attitudes of Americans toward Russian speakers – estimated to number four million in the United States – to deteriorate sharply. He stated that immigrants from Russia tend to assimilate in the United States very well, noting: “If you can make yourself understood in English, you’ll be treated as an American." New Jersey resident Yaldar Bajnouk, a member of the Circassian Benevolent Association (a North Caucasus community) begged to differ. He told RBTH that he had felt no changes in the attitudes of Americans toward him in the aftermath of the Boston tragedy. “When we first heard of the bombings, we hoped that the perpetrators weren’t Muslim. And when we learned that they had come from the Northern Caucasus, we felt ashamed in front of our friends and our colleagues. We felt very bad,” he said. At the same time, he noted that immigrants from this region are grateful to America for having the opportunity to live, work and develop in peace. “So I don’t know why anyone would do something like that,” said Bajnouk, referring to the events in Boston. The terrorist attack on Boston took place last week, when two bombs went off at a 12-second interval during an international marathon. Brothers Tamerlan and Dzhokhar Tsarnaev, immigrants from the Northern Caucasus, are suspected of carrying out the attack. One of them was killed in a shootout with police.